Tears… streaming down my face. Katie McGarry, you showed me what’s what, because a pile of soggy tissues later, and I’ll freely admit, Pushing the Limits is a pretty amazing story that lives up to the hype. Multi-layered, authentic, flawed, empathetic and lovable, in Noah & Echo Katie has created two incredibly different main characters whose stories who, both together and apart, are equally compelling. Two different people, from different backgrounds with different goals, realizing perhaps they’re actually more similar than they initially thought. Their separate journeys toward healing, toward completion, toward self-realization begin to merge, and it’s raw yet beautiful, completely heartbreaking, yet freeing. It causes them both to re-evaluate who they are and who they want to become. I loved watching Noah & Echo as initially they want nothing to do with each other, form tentative bonds with each other, recognizing something in the other that they each need – strength, comfort, encouragement, understanding and, sometimes, just a willing accomplice. Echo. Echo almost died two years ago – an event that she has no memory of, but one that has left her horribly scarred, mentally traumatized, and emotionally numb. Not being able to remember that night, when everyone else involved seems to know the details, she feels like a vital part of herself missing. That she can’t move on until she remembers. Once one of the school’s “it” girls and dating the oh-so-cute-‘n-popular Luke Manning, she became withdrawn after “the incident,” hiding away from her life before, now a pariah and a loner. But at the start of her last semester of high school, Echo resolves to find out what happened to her once and for all. However, as she begins to discover what happened that fateful night, she begins to understand the sometimes stark differences between reality and perception. Noah. The stoner foster kid with the face of an angel and the mouth of a sailor. When his parents are both suddenly killed in an accident, Noah and his two younger brothers become wards of the state. His family becomes even more broken, as Noah becomes separated from his brothers, getting passed around from family to family. Noah vows that someday the three of them will escape the horrors and abuses of the foster system to one day be reunited as a family, and he will do anything to keep his promise. Noah’s a tough kid, but there’s a sense he wasn’t always this way. Rather he’s had to become this abrasive, sarcastic, slightly-jerkish fringe-dweller to survive until he ages out. He wasn’t in the system very long before he realized that the only person you can really ever rely on is yourself. He’s rebellious, a bit jaded, impulsive, with massive (and understandable) authority issues. But even so, he’s been unfairly judged by most adults in his life since entering the foster care system. Noah’s not one to trust easily given his experiences, but his repeated encounters with Echo leave him unsettled and insatiably curious about the scarred girl with the past full of secrets. Voice. Can I just say how much I love, heart, and adore this emerging YA trend of dual perspectives in a romance? I love, heart, and adore it. Though I had a few issues distinguishing when the narrative switched between Noah & Echo, this was due in large part to the formatting of the e-galley. However, each of their voices are distinctive enough that I could tell almost immediately when the POV had shifted. Echo’s voice is a little more melancholy, uncertainty – she’s a lost girl – but she also possesses a lot of strength, determination, and a fantastic amount of sass. Noah on the other hand is “cards-on-the-table” bluntly and sarcastically honest, and he’s so believably guy (High five, Katie McGarry!). But his honesty, while making him a very strong figure, also exposes all his fears, uncertainties and vulnerabilities. It was actually Noah in the end that finally made me grab for the tissue box, not Echo. While I connected with both, there was just something so relatable and lovable about Noah that made his story all the more touching. Story. More than anything, this story is about two people coming to terms with their pasts, finding healing, discovering love, giving life a second chance, making a fresh start – both individually and together. It’s very much a story of emotional growth and coming of age. But it’s also a bit of a mystery in that both Noah & Echo’s back stories aren’t fully revealed at the beginning of the novel. The results of where their respective pasts have brought them are, of course, apparent… but not the cause. Katie does a fantastic job of weaving just the right amount of mystery into her story, stringing me along with tantalizing bits of information as the larger picture becomes more and more clear. Within five minutes of picking up Pushing the Limits, I was completely invested in finding out what happened to Echo. Add in the two wonderful main characters and their fledgling different-side-of-the-tracks type romance, and I was sold. Overall. I didn’t stand a snowball’s chance. Noah & Echo both took my heart by storm, making me laugh, cry, despair and hope in this beautifully woven story about finding love, healing, forgiveness and closure. =) Fantastic review! LOVE that you loved this so much. Hype has kept me away from books before too. I just fear it won’t live up so they sit pretty on my shelf for awhile, unfortunately. I am so glad to see it lived up to your expectations! Great review! But love Noah & Echo, and I loved your review of PTL! Everything you said about it = awesome. You know, I wanted to read this one so BADLY! It was at the top of my comtemp review books. Then I went and read Beautiful Disaster and thought…. 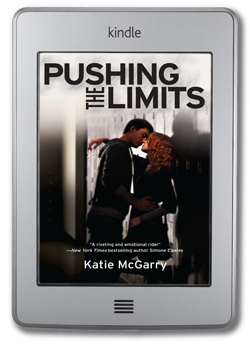 “Ermm… What if pushing the limits turns out to be the same stuff?” And it set me back. Seeing your review, I think it’s quite different *laughs* So… Should I read it or not, Dani? Move it on back up. It’s NOTHING like Beautiful Disaster (which I have read). Both Noah & Echo are WAY more likable than Travis and…… what’s-her-face, Pigeon? (Can’t remember… lol) They’re not nearly as destructive, and Noah’s not even close to being that violent. I look forward to reading this one. Your review is fab and helpful. Great review! I absolutely loved this book as well it was so easy to fall in love with both characters. And I have to agree with you on the dual perspective thing. I get so excited when I pick up a book and find out I get to get inside both of the characters heads. This was a book that really does live up to the hype! AMAZING review, Dani! I knew you’d love this book. Every time Noah interacted with his brothers, I absolutely bawled. I was more into his story than Echo’s, but I loved the whole book. I agree with you that Noah was a believable guy and that I enjoyed the alternating POVs in first person. Wonderful review! I just loved this book. It was an emotional journey, but one I so enjoyed. Thanks! And yes, yes it was! And I agree! I’ve been wanting to get my hands on this one for a while now. I’m so glad you loved it – thanks for the amazing review! Yes, it’s fantastic! I hope you get the chance to read it soon! You are so not alone – I still get all gooey thinking about Noah and Echo, months later. Loved this book, loved this review – it makes me want to read it all over again! Thanks Kelly! Yes. Gooey… they are just so good together And yes, I need to reread this one very soon! Oh wow, this one has to be one of my favourite books of 2012. I love how it is written in two alternate points of view. We see tings develop from Noah’s prospective, then get to see things from Echo’s perspective. Neither of them have had very fantastic background , they both come to their relationship with their very own baggage but for all their own faults they seem just perfect for on another, and BK#2 Dare You To is firmly on my 2013 MUST read list. And I have to add that Katie McGarry is such a friendly author with fans and their questions etc too! Yes. It was a GREAT book for all of those reasons! Looking forward to DYT as well, and yes, Katie is sweet! omg! pushing the limits.. been spamming the publishers just to get my hands on this ( nothing arrives at my mail).. Thanks! This book is uber-fantastic, and it has been released so it’s out in bookstores! Hope you get to read it soon! They took my heart too. Great review. This is one of my fav books in 2012. Yeah… it is just a fantastic book. Glad you loved it too! Yes, yes, yes. And I too love the sibling love in PTL. <– Sweet. I loved Pushing The Limits too. Great read and discovery thanks to the bloggers! I don’t think I would have picked it up otherwise. So excited for the 2nd book! Yay! I’m so glad you gave it a try… AND loved it! I loved this book too. Btw, Daring You To (book 2) is up on netgalley since yesterday! YAY! And thank you! I hope you enjoy it! I just had to get this book after your review! It was amazing and so, so sad! A bad boy orphan who wears a leather jacket??? Mother, may I!!! I usually don’t like the hyped up YA books, but this one has me really intrigued. I am also a big fan of the multiple POV trend! LOL…. You’ll have to take that up with Echo. 😉 Yeah, I hope you give this one a try despite the hype! Great review! Everyone is loving this book but I haven’t read it yet even though it is on my shelf… thanks for a review that pushes past the hype. Great review! I really enjoyed this book also. Yay! Glad you liked it too, Sam! This is one of the books that I cannot wait to read! Just hoping to find the time soon!